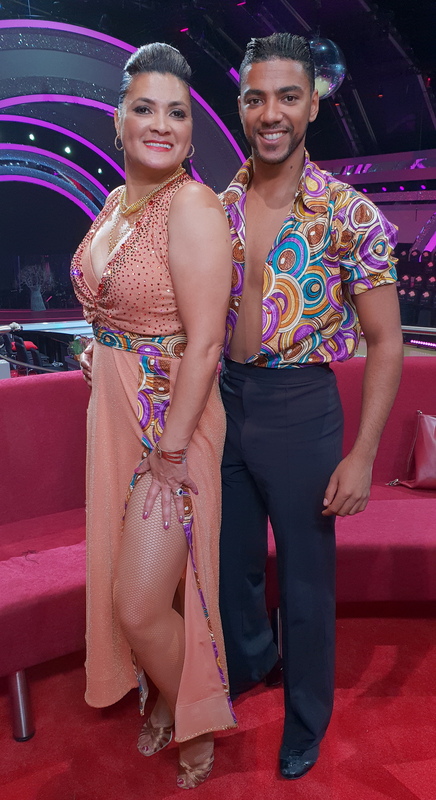 At the end of this week’s star-studded “South African Songbook” theme, inspiring athletics coach Odessa Swarts and her professional dancing partner Dylon Daniels ended their dancing journey on M-Net’s Dancing With The Stars SA while the judges gave Protea netball shooter Vanes-Mari du Toit and Johannes Radebe the opportunity to return next week to “dance some more”. During the two-hour Dancing With The Stars SA live extravaganza at Hyde Park Corner in Johannesburg, the ten remaining couples in the competition showed off their skills to the songs of massive local hitmakers such as Vicky Sampson, Mango Groove, Miriam Makeba, Goodluck, Laurika Rauch, MiCasa, Freshly Ground and Black Coffee. And, almost as if they were suffused with national pride, many of them earned their best scores do date in the competition from the team of internationally acclaimed judges. But after the viewers’ votes were reconciled with the scores from Bryan Watson, Debbie Turner, Tebogo Kgobokoe and Jason Gilkison, it was time to find out in the 20:00 Dancing With The Stars SA live results show which two couples found themselves at the bottom of the leaderboard, meaning they had to dance-off to stay in the competition. The moment of truth could be postponed no longer, as Dancing With The Stars SA host Chris Jaftha announced which couples would return to dance again next week. Vanes-Mari and Johannes Radebe had to Cha-Cha-Chá again, knowing that Latin dancing is not her favourite style. “You’ve still got some work to do in your Latin dances,” judge Jason told Vanes-Mari after her performance. Tebogo admitted that the judges were surprised to see her in the Dance-Off, but a cool and calm Vanes-Mari said she welcomed the opportunity to show them what that Cha-Cha-Chá should look like. When they had to pick a couple, all four the judges opted for Vanes-Mari and Johannes. Viewers have to register at mnet.tv/dwtssavote to participate in the live Dancing With The Stars SA voting. Voting registration opened again at 20:30 tonight and will close at 16:30 on Sunday, 11 March, ahead of the next live episode. Viewers only need to register once to be able to vote in every episode of the season. The vote count and ranking of contestants that determine the results are done according to the international format rules and areindependently computed by Deloitte and Touche and confirmed against the vote results determined by M-Net.